Title and monogram stickers are a great help in finishing off your pages quickly while still keeping your creativity and sense of style. This page shows how to use them to your advantage and get your pages done in less time. This layout was created with Pixie Press patterned paper, brown cardstock, Foofala Brown Ivy paper, brown ink, Bo Bunny Destination stickers and Creative Imaginations Type Keys Embossed stickers. 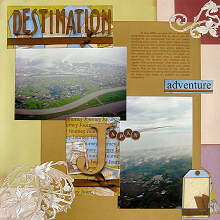 Use the Pixie Press paper as the background. Cut a piece of brown cardstock measuring approximately 21/5cm by 27cm. Ink the edges with brown ink. Add your journaling to the top right corner. Adhere to your background along the bottom edge and approximately 3cm from the right edge. Position your photos on your page as shown above and adhere. Place your 'Destination' sticker in the top right corner of your page so that it slightly overlaps your photo. Place your 'Adventure sticker underneath your journaling. Place your 'J' (for journey) sticker so that it slightly overlaps both of your photos, as shown in the layout above. If you wish, you can use Creative Imaginations Type Keys Embossed stickers to make the 'J' into a word that overlaps your photo (I made mine Japan). Place your two tag stickers in the bottom right corner of your page. Layer them on top of each other so one is poking out behind the other, as shown in the layout above. Finally, cut out some swirls from Foofala Brown Ivy paper and adhere to the top right and bottom left corners of your page. If you prefer to do something quicker, you could try doodling or stamping swirls instead.